March 7, 1981: Antonio Inoki & Riki Choshu defeated Hulk Hogan & Perro Aguayo in Kisarazu, Japan. 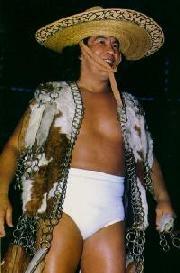 AAA/IWC When World’s Collide: Perro Aguayo defeated Konnan in a vicious and bloody Steel Cage Match. December 26, 2003: Perro Aguayo Sr., who turns 58 in a few weeks, ran-in saving his son from a beating from Los Hermanos Dinamita.